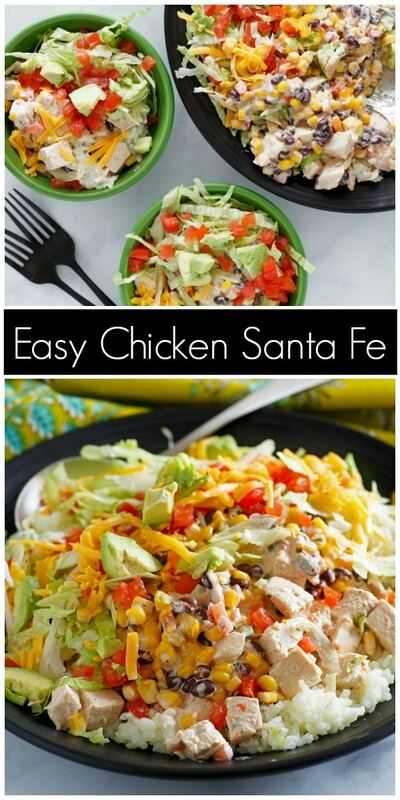 Easy Chicken Santa Fe is a dinner recipe that will save you on busy weeknights. It’s made in the slow cooker! Watch the short video showing you how to make it. The printable recipe is at the end of this post. It’s a little embarrassing how easy this is. And your family will think you’ve gone all out for them. Delicious! 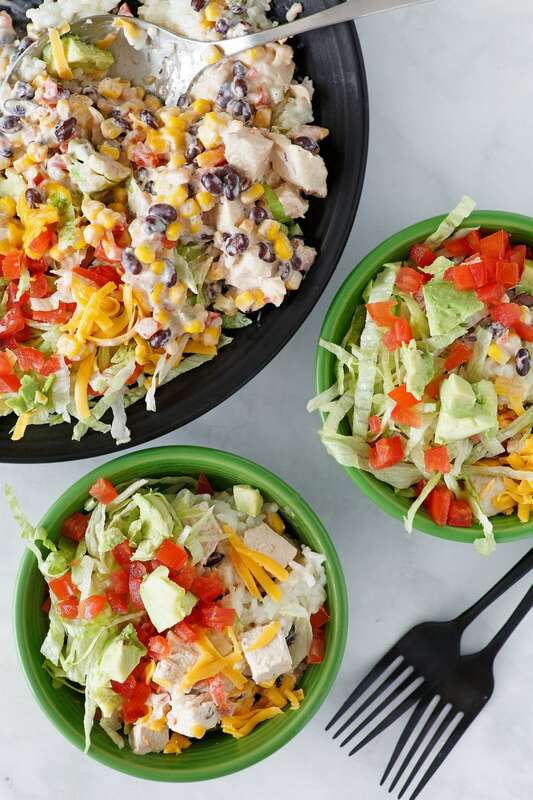 You don’t have to be any kind of experienced cook at all to make this Easy Chicken Santa Fe. All ingredients are literally just dumped into your slow cooker. No special kitchen skills needed! All you have to do is put black beans, corn, salsa and chicken into your slow cooker insert and let it cook for three hours. After three hours of cooking, the chicken will be pull-apart tender, and you will remove it, cut it up and return it to the slow cooker with a package of cream cheese. The cream cheese will melt into all of the other ingredients in the slow cooker, and then it’ll be ready to serve! The video shows the cream cheese being dumped into the slow cooker (please cut it into chunks before adding it to the slow cooker). It will melt into the hot slow cooker chicken mixture much more quickly if it’s cut into pieces first! 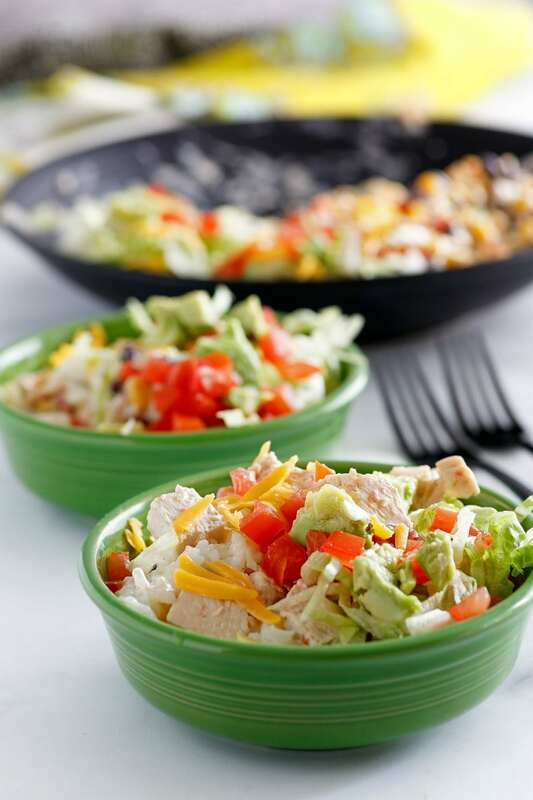 Easy Santa Fe Chicken is family friendly, and everyone always loves it. This is such a simple dinner recipe, and it’s one of those kinds of recipes that will save you on busy weeknights! Family seems to love this one as you can customize how you’d like to eat it. 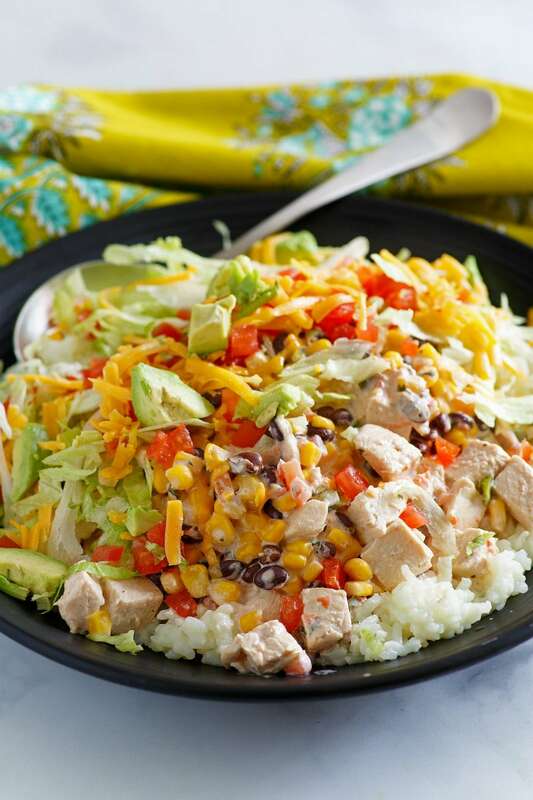 We enjoy Chicken Santa Fe served over hot steamed rice, and then everyone adds their own desired toppings. I suggest a little lettuce, tomato, and cheese.. Avocado lovers can add avocado too. It also makes for a great taco filling! 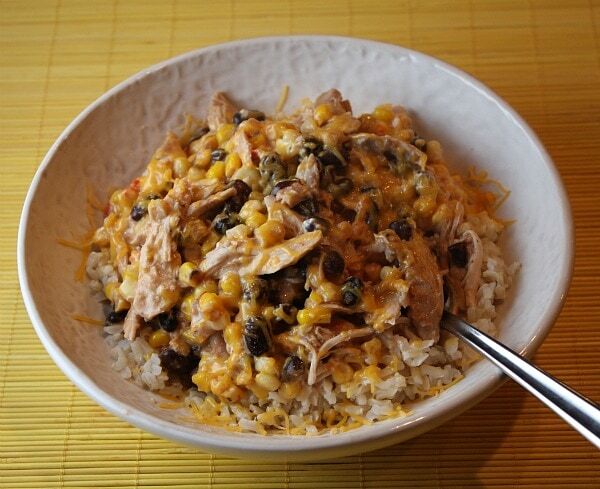 This slow cooker chicken santa fe recipe is so good served over rice and topped with desired fixings. In a slow cooker, add beans, corn and 1/2 cup salsa. Top with the chicken and spoon remaining salsa over the chicken. Cover and cook on HIGH for 3 hours, or until the chicken is tender and cooked throughout. Remove the chicken to a cutting board and cut into bite-sized pieces. Return the chicken to the slow cooker along with the cream cheese. Stir and let cream cheese melt into the mixture to create a creamy sauce. 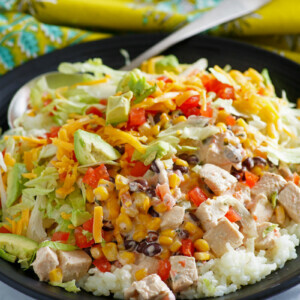 For serving: You can serve the chicken and sauce over rice with a sprinkle of lettuce, tomato and cheddar cheese on top. Or you can serve these as tacos with cheese and a couple of taco fixings such as lettuce and tomato. Nutritional information does not include rice or toppings. 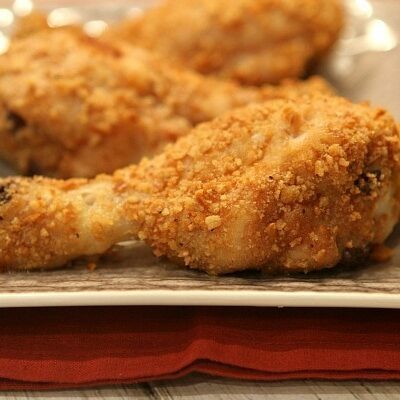 For chicken, the thighs will turn out more moist and tender than the breasts in a slow cooker. I like to use bone-in thighs and remove the skin. After the 3 hours, I remove the thighs, cut off the chicken, discard the bones and return the chicken to the slow cooker. You can use breasts too, just be sure not to overcook them or you'll run the risk of drying them out. Alternately, you can prepare this in the oven- 350 degrees F. for about 70 minutes. If you're watching your weight, you can most certainly leave out the cream cheese. It makes an awfully yummy sauce, but the corn/beans/salsa/chicken mixture would also make for an excellent dinner over rice or inside tortillas. If you're preparing this recipe as GLUTEN FREE, use GF corn tortillas for tacos! Is the video linked somewhere? I see text for it, but no related link. Mine turned out a tad bland for our liking (Possibly due to the salsa we chose) .. any thoughts on making it more flavorful without it ending up too spicy?? Yeah, choose a salsa you love. 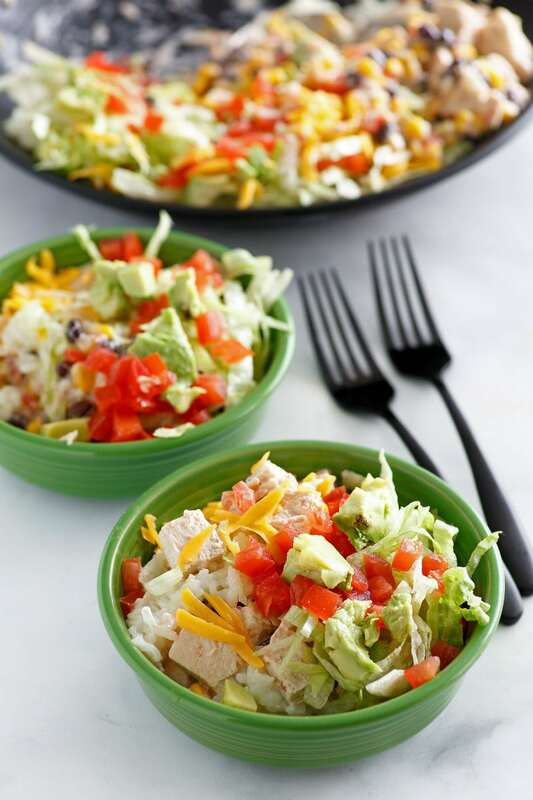 Add good toppings– sharp cheddar cheese, cilantro, sour cream, avocado! This looks delicious! 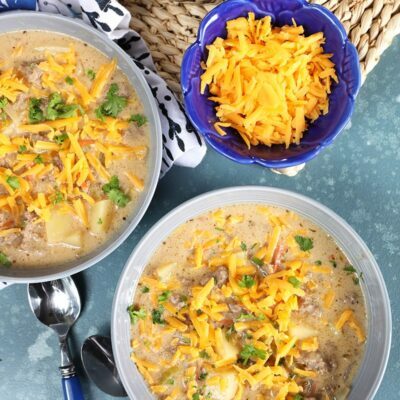 Is there a reason why you can’t go with boneless/skinless chicken thighs and still use the crockpot vs. the oven? Thanks! Your recipes look so darn good! Soy cream cheese should work well as a no dairy substitute. My kids have had dairy issues, but are now ok with dairy since we went on the gluten free diet. I used regular cream cheese (fabulous recipe — used pork because I am allergic to chicken. was terrific). However, if my kids still had dairy issues — I would not have hesitated to substitute soy cream cheese in. and just leave the cheddar out. This looks good but my little guy is allergic to dairy. Any suggestions on substitutes? Thanks! Which substitute for the 8 oz of the cream cheese will work better – the same ounces of Sour Cream or Silkern Tofu? I’m making this as an anniversary dinner tonight. I can’t wait to try it! Found this recipe on Pinterest and I sure am glad I did! It was delicious! Thanks for sharing! Will be making this a second time tomorrow for my sister and family who are flying in from out of state. It’s delicious and so easy! Thanks!!! Mmmmmm – Just made this and it is so yummy! THanks for the great and easy recipe! I think my family will love this. I make something called Southwestern Strudel from puffpastry.com and both recipes have a lot of ingredients in common. This looks so good! This could use some cubed avocados and fresh herbs. Think it’d also be delicious over a baked potato. 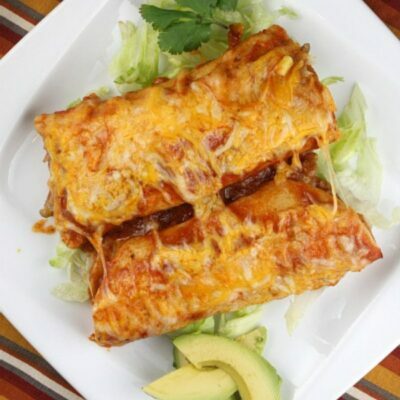 Tried this recipe with my family the other night with homemade tortillas! Amazing and very easy! I really enjoy all these recipes! 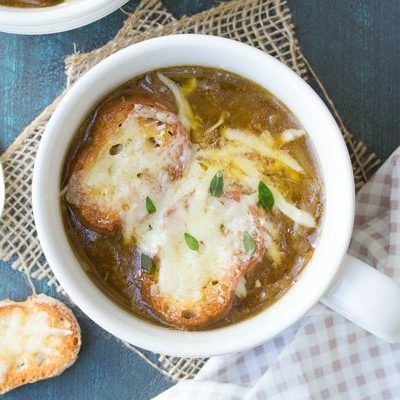 I am always looking for good crockpot recipes! This looks tasty and simple, I will have to try it out! Thanks! Looks very good! I love rice and chicken together. Will be trying it soon. This sounds delicious! Quick and easy, too…thank you!